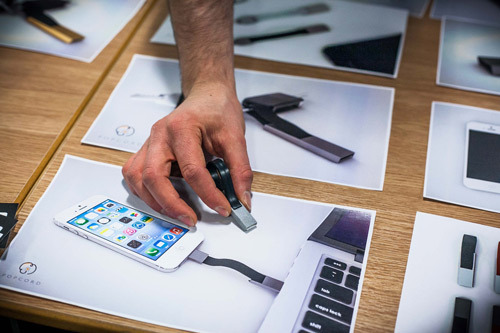 City University London postgraduate student Frank Milani is launching a Kickstarter campaign to raise £20,000 to manufacture Popcord, an innovative mobile phone charger. Popcord is a small lightweight device attached to keyrings or laptop bags, relieving users from remembering to carry mobile phone chargers with them. Frank and his business partner, Matt Sandrini, have been developing Popcord since early 2013. Having produced three prototypes, they have sourced a suitable manufacturer and need to raise the funds to begin production. "Being part of the MICL whilst developing Popcord has helped me in many ways. I am surrounded by inspiring people on a daily basis and this has been crucial in helping me maintain focus and motivation throughout the development stages. In addition, the wide spectrum of topics covered by the course has given me the expertise to tackle unexpected challenges like writing the screenplay for the Kickstarter video." '"We are delighted to see students on the MICL taking what they are learning from the course and applying it in so many exciting ways. Frank's business idea is a great example of this, and we wish him every success in obtaining the funding he needs to take his idea to the next stage." "In addition to the support from my course leaders and classmates there is so much extra support for entrepreneurs here at City. The input from the CityStarters team (City's student enterprise team) and The Hangout (City's entrepreneurship centre) has been invaluable in developing both Popcord and the Kickstarter campaign." "Popcord is a great example of how student entrepreneurs can take advantage of new forms of finance to launch innovative new products and ventures. I'm a great believer in this approach and think it provides two key benefits for would be start-up founders over traditional options such as trying to secure a bank loan or win prize money via enterprise competitions. Firstly, it forces entrepreneurs to really think about how they communicate and sell their idea and secondly it is a great way to test and validate real market demand for new products and services."